In this computer graphics image released by the Japan Aerospace Exploration Agency (JAXA), the Hayabusa2 spacecraft is seen above on the asteroid Ryugu. Japan's space agency JAXA said Friday, April 5, 2019, its Hayabusa2 spacecraft released an explosive onto an asteroid to make a crater on its surface and collect underground samples to find possible clues to the origin of the solar system. The mission is the riskiest for Hayabusa2, as it has to immediately get away so it won't get hit by flying shards from the blast. Japan's space agency said an explosive dropped Friday from its Hayabusa2 spacecraft successfully blasted the surface of an asteroid for the first time to form a crater and pave the way for the collection of underground samples for possible clues to the origin of the solar system. Friday's mission was the riskiest for Hayabusa2 because it had to immediately move away so it wouldn't get hit by flying shards from the blast. The Japan Aerospace Exploration Agency, or JAXA, said Hayabusa2 dropped a small explosive box which sent a copper ball the size of a baseball slamming into the asteroid, and that data confirmed the spacecraft had safely evacuated and remained intact. JAXA later confirmed the impact from images transmitted from a camera behind left by the spacecraft which showed the impactor being released and debris later spraying from a spot on the asteroid. "The mission was a success," JAXA project manager Yuichi Tsuda said. "It is highly likely to have made a crater." This image released by the Japan Aerospace Exploration Agency (JAXA) shows an explosive dropped from Hayabusa2 spacecraft to make a crater on the asteroid Ryugu Friday, April 5, 2019. Japan's space agency JAXA said its Hayabusa2 spacecraft successfully dropped the "small carry-on impactor" made of copper onto the asteroid and collect its underground samples to find possible clues to the origin of the solar system. 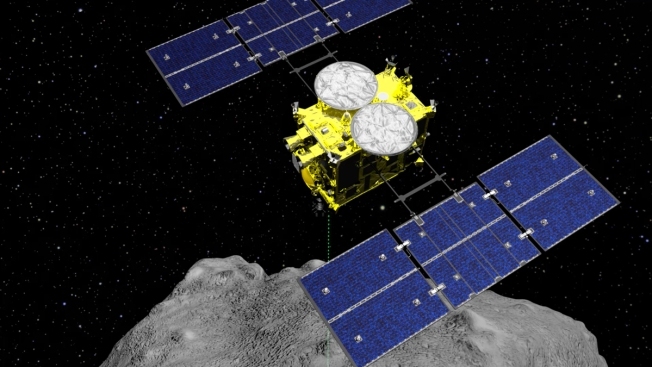 JAXA plans to send Hayabusa2, which was moved to the other side of the asteroid, back to the site after dust and debris settle for observations and to collect samples of material from the new crater that was unexposed to the sun or space rays. Scientists hope the samples will help them understand the history of the solar system, since asteroids are left over material from its formation. No such samples have been recovered. In a 2005 "deep impact" mission to a comet, NASA observed fragments after blasting the surface but did not collect them. "So far, Hayabusa2 has done everything as planned, and we are delighted," mission leader Makoto Yoshikawa said earlier Friday. "But we still have more missions to achieve and it's too early for us to celebrate." Hayabusa2 successfully touched down on a small level area on the boulder-strewn asteroid in February, when it also collected some surface dust and small debris. The craft is scheduled to leave the asteroid at the end of 2019 and bring the surface fragments and underground samples back to Earth in late 2020. The asteroid, named Ryugu after an undersea palace in a Japanese folktale, is about 300 million kilometers (180 million miles) from Earth.